Softobe's FoldersSynchronizer X 3.6.3 has a small, unassuming, single-window interface that belies a full-featured and reasonably capable file synchronization utility. As in most tools of this sort, you select two folders or volumes—typically one on each of two Macs—and set several options, such as whether you want to copy files in just one direction (backup) or bidirectionally (sync), and whether you want to synchronize deleted files. Click on a button and the program copies files per your preferences to make the two folders or volumes identical (or as nearly so as you specified). Among the numerous settings you can specify are individual files or folders to exclude; filters that search for items to include or exclude based on patterns (such as name, size, or kind); how to deal with aliases, symbolic links, and invisible files; and what actions to take under various circumstances when a file has been modified in both locations between synchronization runs. The program can also automatically mount servers before synchronizing files, and unmount them afterwards. You can preview what changes will occur before performing a sync, and choose how to handle any conflicts that arise. 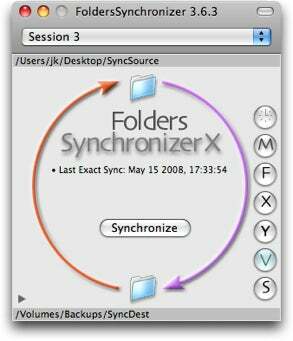 FoldersSynchronizer X lets you easily set up multiple pairs of folders to synchronize at once (as long as all pairs share the same settings), and you can schedule synchronization to occur at certain time intervals, on particular days, or both. Frustratingly, though, schedules run only when the application is open; if you accidentally close it, no sync occurs, and you get no warning. Softobe also publishes FoldersSynchronizer Lite, a stripped-down version of the program, for $20. Unlike the full version, the Lite edition (version 3.6.1) lacks support for excluding or filtering items, syncing multiple folders at once, automatically mounting servers, and scheduling syncs; it also omits numerous options for dealing with conflicts. With rare and minor exceptions, the program correctly preserves file ownership and permissions when copying files, and can be used to create a bootable duplicate of an entire startup disk. On the other hand, the program failed to correctly copy certain Mac OS X metadata, such as Access Control Lists, Unix hard links, and some HFS+ extended attributes; and when set to copy invisible files, it sometimes made the copies visible. Although these issues are unlikely to affect day-to-day operation for the average user, power users should test the application carefully before relying on it. Beta versions of FoldersSynchronizer X 3.6.4 we tested resolved some, but not all, of these problems. This small, single-window interface hides a great deal of complexity: click any of those buttons on the right and you'll see numerous configuration options. Although Softobe is clearly trying to keep the interface as simple as possible, the company goes too far in some respects, actually making the program harder to use. For example, the main window has a series of buttons on the right side labeled with single letters ("M," "F," "X," and so on), most of which take you to configuration screens that replace the window's contents. Although you can see what the buttons do by reading tool tips that appear when you hover over them (or rely on menu commands to perform the same actions), the program would be much easier to use if the buttons were simply made wide enough to accommodate full words or phrases—and if the main window always remained visible while configuration options appeared in another dialog. Once you learn your way around the interface, you can get FoldersSynchronizer X 3.6.3 to do most of the syncing tasks you may need. But the interface is unnecessarily obscure, and having to keep the program running all the time for scheduled syncs to occur is awkward. If you don't need to copy files with root access (to preserve ownership and permissions for other users, or to create bootable duplicates), the less-expensive ChronoSync ( ) provides more flexibility and a clearer interface.